During Spring Break last week, my kids had to forfeit a day of camp after a massive snow dump covered our city and almost shut it down completely. This suited me fine because I was still adjusting to the daylight savings time change and welcomed any chance to stay cocooned in my oversized duvet a little longer. I find the time change proves much more difficult to spring forward rather than fall back; it's like having jet lag for a week without the golden tan or happy memories of travels. Once I dragged myself out of bed, the morning quickly faded into lunchtime and we still hadn't changed out of our pyjamas. I made lunch and, against my better judgement, allowed my littles the treat of sitting in front of the television to watch a show. I often veto this request due to the fact that a spill of some sort is always inevitable. As they flipped through the channels, the screaming garishness of The Price is Right stopped them in their tracks. They settled in, devoured their grilled cheese sandwich, tomato soup and a chocolate milk chaser and became entranced with the glitz and dazzle of the show - much like I did when I was their age, except I would sit at my Grandma's feet while she did her crossword puzzle in her rocking chair. The rocker would simultaneously massage my lower back. I went back into the kitchen to clean up when I heard my daughter shout the aforementioned exclamation. I had been drinking my third cup of tea when my eyes inadvertently rolled. I let out an exasperated sigh, gently put my tea cup down, and walked into the living room armed with a overly damp tea towel slung over my shoulder, betting it was her chocolate milk that she had spilled all over the coffee table. Instead, I found her sitting with a horrified look on her face, gripping her glass studiously. "MOM. This lady won a living room set. I mean, A LIVING ROOM SET. AND CARPETING. CARPET, MOM. That is not a prize!" I laughed. Hard. And the wet spot from the towel on my shoulder was getting increasingly larger by the minute. I would wager my next three paycheques that those very words came out of my mouth when I sitting at my Grandma's feet and a contestant won a barbecue grill or a bedroom suite. It's funny how material items change. At age ten, everyone wants the car, the mopeds, or the cruises, but by thirty, most of us know that a living room suite with broadloom carpet will get one many more miles. When I explained this to her and the fact she won't get that exact living room, she still wasn't satisfied. "They could have thrown in a hoverboard or something!" Sure. They could have. I tucked into my own grilled cheese as I threw my fuzzy sock-covered feet onto the coffee table and almost upended my son's cup that was still filled with chocolate milk (OOPS) and watched the rest of the show with them. I can't remember the last time I laughed so much with my kids. It made me realize that not only are they growing up too fast for my liking, but that they have a good grasp of what's going on around them, have my sense of humour and will be hilarious adults. They opted to watch the episodes in lieu of our Friday night movie. The laughter picked up where we had left off mid-week while we ate waffles. Lots of waffles. First with homemade chicken fingers dipped in maple syrup for dinner; later with ice cream smushed in the middle for dessert. There is a misconception that pancake batter and waffle batter are one in the same. 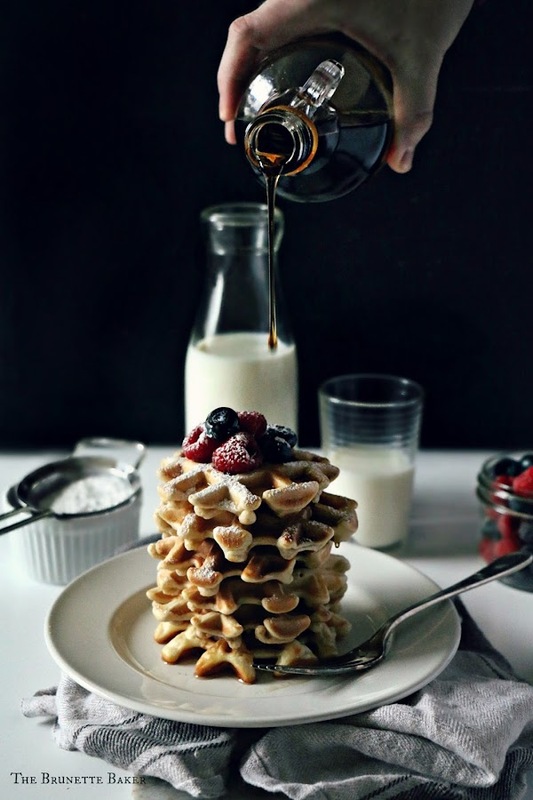 Waffle batter is much thicker than pancake batter and waffles require a higher fat and sugar content to help with achieve a crispy and golden texture. Although pancakes have a very special place in my heart, waffles have comfortably snuggled their way in. And these waffles freeze beautifully. I popped them into the oven for breakfast Monday morning as they got dressed for school and shouted, "KIDS! IT'S BREAKFAST! COME ON DOWN!" It's best to leave the voice overs to the professionals. Me? I'll stick to what I know. Prepare a waffle iron by lightly spraying with a non-stick coating spray. Preheat oven to 200 F degrees. In a large mixing bowl, whisk eggs vigorously until light and fluffy. Add in melted butter, buttermilk and vanilla, if using. Mix well and then set aside. In a separate mixing bowl, measure out and whisk together flour, granulated sugar, baking powder, and salt. Slowly incorporate dry ingredients into wet, whisking continuously to avoid lumps. Batter should be smooth, but thick. If you do find you have lumps in the batter, it's perfectly fine. Using a ¼ measuring cup, measure out batter and pour onto hot, prepared waffle iron. Waffles are done when golden brown and should release from iron with ease. Place finished waffles in preheated oven. This is to keep them warm and crisp while preparing the rest of the waffles until ready to consume. Remove from oven and serve with your favourite berries, maple syrup, whipped cream, or chocolate hazelnut spread. My kids love colourful, jimmies sprinkles added to the batter. These waffles also serve as a perfect base for ice cream sandwiches. Inspired...for waffles and TPIR! Love your writing, its like I'm there with you guys. Your post hit home for me! I was laughing mainly because I was the same way as a child. I loved when they offered up jet skis or a boat and used to think of all the places I would go if I won. It was always the mall or the lake behind my house. LOL. AND YES TO THE WAFFLES. Pinning! Got a great laugh with this post! I enjoy your writing it inspires me for my own food blog. Thanks for sharing. This post hit home with me as my kids love game shows and Price Is Right is a big family favorite! You're quite funny and gave me a good laugh. Thank you! 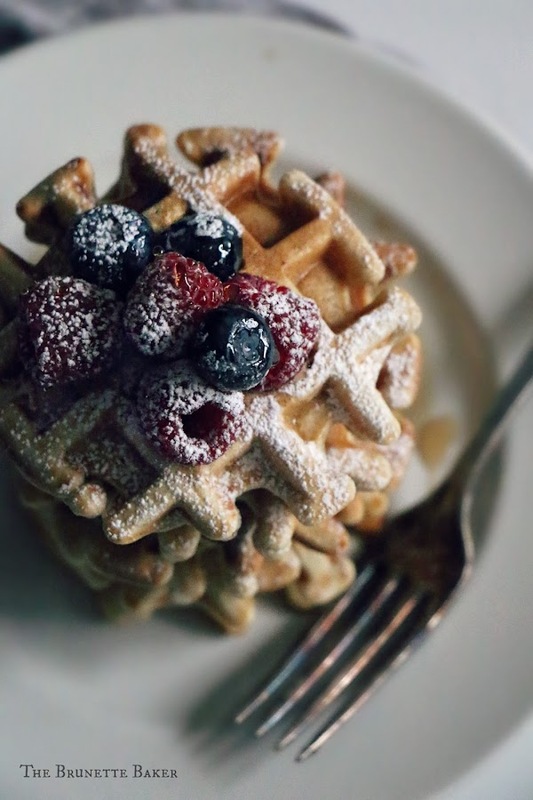 Your waffles are on the list to try this weekend. haaaa I'm old too because my first reaction to that prize was "whaaaat-that's suhweeeet!" lol. Anyway-these waffles are also DEFINITELY DEFINITELY not disappointing-they look so gorgeous and the texture is perfection! 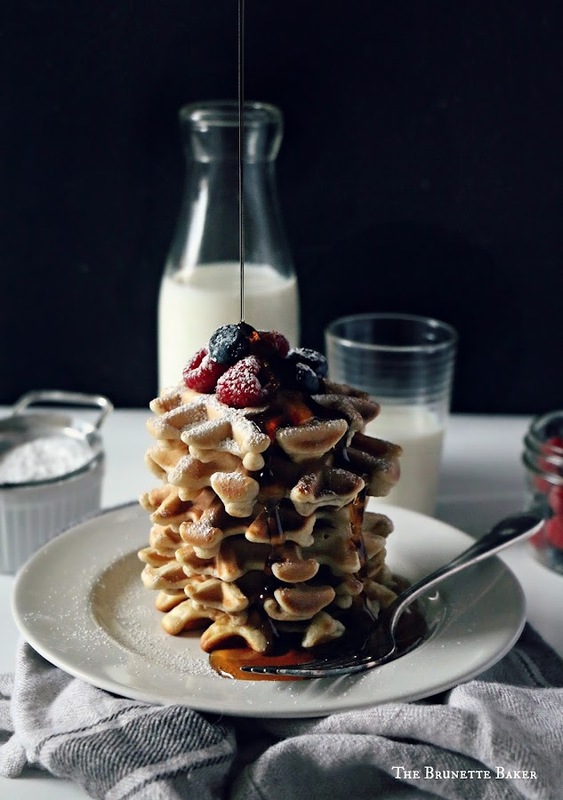 Made these waffles this weekend and they were heavenly! I had some left over for my daughter's lunchbox today. Great recipe!! !